The Getty Provenance Index® is a highly regarded digital humanities resource that documents the history of collecting and art markets across four centuries. A team at the Getty is at work on a three-year project to transform its 1.7 million records into linked open data, which will be accessible through a new search tool starting in 2019. Here research assistant Jacquelyn Clements details her recent project to trace the identity of artworks bought and sold by Knoedler’s New York office over nearly a century. See all posts about the Provenance Index remodel here. —Ed. In the game of connect the dots, a player draws lines between seemingly random points to reveal a recognizable picture. The process of connecting the 1.7 million records that constitute the Getty Provenance Index functions in much the same way. Linking provenance data points helps us to form a picture of how individual works of art traveled through different places and hands over time. 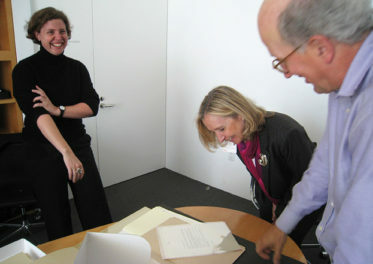 As a research assistant (now metadata assistant) with the Project for the Study of Collecting and Provenance at the Getty Research Institute, I helped to clean and standardize records from the Getty Provenance Index as part of a remodel project that marks the transition from a traditional database structure to one based on linked open data (LOD). In this new system, the records—the “dots,” if you will—represent people, places, events, and art objects. The new system links them together to form a broad picture of the historic art market and its practices in both Europe and the United States. One of my long-term projects this year was to build a concordance—a “record of records”—of purchases and sales from the Knoedler Gallery Archive. In eleven stock books from the New York office dated between 1872 and 1970, M. Knoedler & Co. kept careful records of each object bought and sold to various dealers and individual art collectors. Event dates, titles, artists, and dimensions are just some of the recorded metadata that inform us about individual works of art that passed through Knoedler’s stock between these dates. The Uniqueness of Inventory Numbers…or Not? This is where inventory numbers enter the picture, as they act as unique identifiers for every object that passed through Knoedler’s stock. This makes them crucial for understanding why and how objects moved between people and places in the art market. 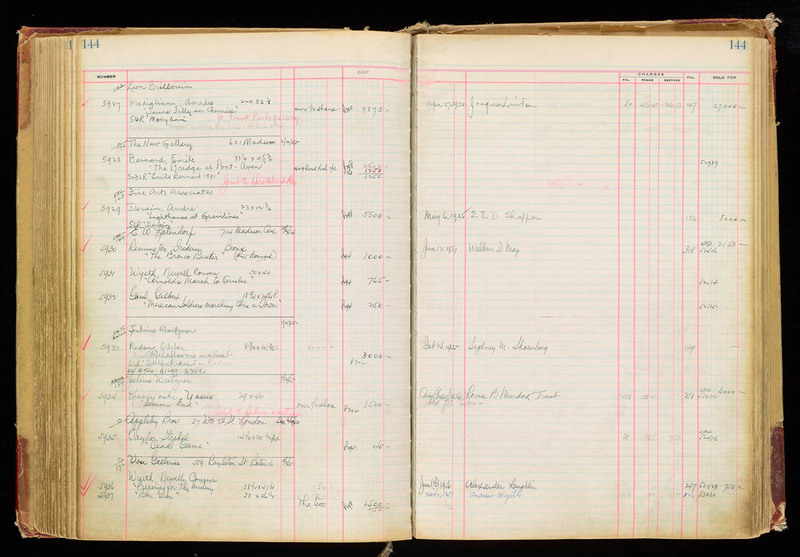 A typical Knoedler stock book page (Book 10); inventory numbers are written along the left-hand side of the ledger. Working with inventory numbers is not always straightforward, however. For one thing, the same number can appear multiple times throughout Knoedler’s stock books. If an object didn’t sell, for example, the stock number would be carried over to a new book once the former book was full. On the other hand, sometimes a different inventory number was assigned to the same art object. If an object stayed in stock for a lengthy period of time, or if it was sold and then returned, it might be assigned a second number—and sometimes even a third, fourth, and so on. At most, I’ve counted up to eight different numbers associated with the same object in Knoedler’s records. Confused yet? Despite this complicated structure, there was a method to Knoedler’s madness, and once I discovered it, I found the clarity and organization of their record-keeping to be enormously helpful in understanding their system. To understand what’s going on, we can look at individual stock book entries, where “extra” numbers are usually written alongside the main inventory number. Sometimes they are easy to spot: the appearance of “ON” (“Old Number”) designates the number of an object from previous stock for the same object. Other times, Knoedler would write “New #” next to the associated number in the older stock book. This system of renumbering objects remained in place even if a new artist attribution or slight change of title occurred. Two numbers (16292 and [A]9130) for the same object, John Singer Sargent’s Pomegranate Tree, documenting its sale in 1966 and return in 1967. Other records in the Dealer Stock Books trace the painting’s entrance into Knoedler’s stock as early as 1928. Needless to say, compiling all of these numbers required a keen eye and a lot of patience. I was up to the task: my background as a field archaeologist, which involves intensive measurements, data compilation, and record keeping, made me a good candidate to build a concordance of Knoedler stock numbers. Years of data compilation in the field helped me understand why a spreadsheet of numbers was a critical component in creating links between the Knoedler Gallery’s stock through time. Only this time, I could do it from the comfort of my desk rather than under the blazing Mediterranean sun. Instead of digging and sieving dirt, I had pages and pages of stock books to comb through. Screenshot of the Knoedler concordance: each row is a single object; each column records the known inventory numbers associated with that object. Knowing that the majority of numbers would appear late in Knoedler’s transactions, I started with the eleventh book in the series of stock books and worked my way backward, scanning each page for associated numbers. Every time I saw what looked like an inventory number, I recorded it in the spreadsheet. It was a fairly straightforward process, except when I couldn’t read a Knoedler staff member’s messy handwriting, or the numbers had been recorded incorrectly, or “mystery numbers” appeared that weren’t clearly inventory numbers. Each of these issues required research and teamwork to sort through. The result is a simple spreadsheet in which each row represents a record of inventory numbers as they appear in the stock books, and each column represents other numbers associated with each number. I read through 2,824 pages of archival pages and documented close to 10,000 rows of inventory numbers in the spreadsheet, all of which took nearly 10 months. At times, it was a repetitive (and sometimes boring) visual scroll through pages and pages of archival records, looking for numbers that might be united. More frequently, however, the process sparked interesting questions about the travel of artworks through Knoedler’s stock. One excellent tool for exploring questions about artworks’ travels over time are data visualizations that can be produced using the Knoedler concordance. 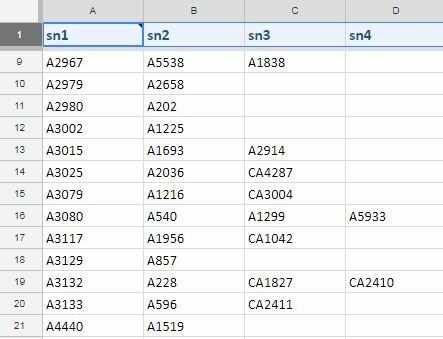 By programmatically linking together all rows from the spreadsheet that ought to be treated as the same object, and sorting them by stock book, page number, and row number, you get a rough chronology of the order of the entries. 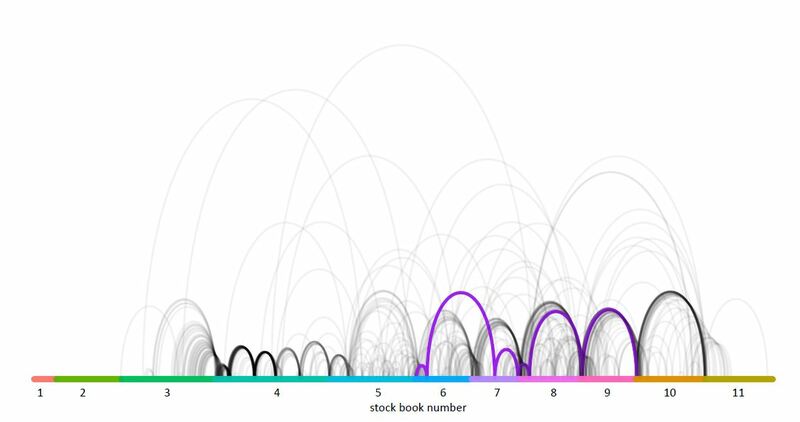 The example below illustrates how the concordance can be used to visualize an object as it travels through the stock books and subsequently through time. The purple lines illustrate a particular painting, Nathaniel Hone’s Portrait of a Lady in a White Dress, and its appearance in Knoedler’s stock over the course of multiple stock books between 1912 and 1954. It is set against a background of other similar movements of works of art through the Knoedler Gallery (the lines in black and grey). The 80-year total coverage of Knoedler’s eleven stock books shows that many objects had similar trajectories, and each of these can be explored using the concordance of inventory numbers. In total, I united records for 1,809 individual objects through the Knoedler concordance, which reconciled 15,906 total stock numbers and helped clarify provenance chains that would have otherwise been erroneously separated and broken. What does this all mean? In the forthcoming linked open data model, researchers will be able to better understand the journeys of many objects that passed through the doors of the Knoedler Gallery, sometimes multiple times over. Building the Knoedler concordance gave me the opportunity to stumble upon the individual stories of these objects. 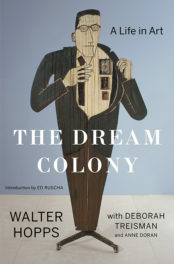 Years of studying art history came alive as I saw well-known names of artists and collectors jump out from the pages – people and objects that Knoedler interacted with in person. Many of these objects still have homes in American museums today; take, for example, the lovely Portrait of Mrs. Maria Anne Fitzherbert by Thomas Gainsborough. 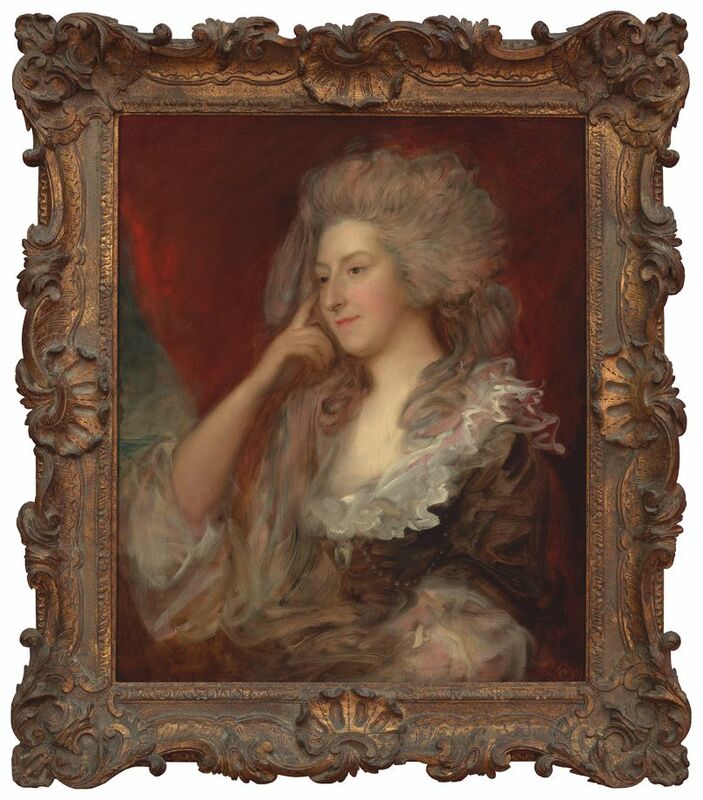 Knoedler purchased and sold Gainsborough’s Portrait of Mrs. Fitzherbert to multiple collectors and dealers between 1907 and 1941, when it was purchased for the final time by the Fine Arts Museums of San Francisco. Today, the painting hangs in the Legion of Honor, but thanks to the Knoedler records we can understand its provenance much better. Although documented as being from the “J. Horace Harding collection” prior to its arrival in San Francisco, the Knoedler stock books reveal several prior owners dating back to 1907, as well as Harding’s return of the painting to Knoedler in 1935. The Knoedler concordance allows us to see this data in inventory form, model it, and understand the painting’s history in a way that previously wasn’t possible. 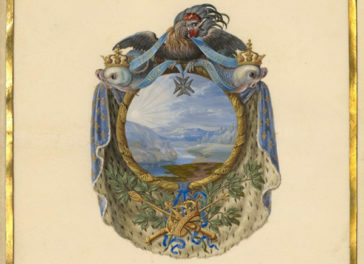 In the future, users of the Getty Provenance Index will be able to follow an artwork’s entire journey through the Knoedler Gallery and even connect to related resources outside the Getty Provenance Index. This concordance of numbers will allow all events that are associated with a particular artwork to be clear and easily traceable. Moreover, it will provide a greater understanding of how individual objects moved in and out of Knoedler’s stock over time, illuminating the role that this gallery played on multiple occasions in the shaping of the American art market of the late nineteenth and the twentieth centuries. Thanks, Lidia, I’m glad you enjoyed it! Will this also include prints sold through Knoedler? Hi Cynthia, good question. There might be a few prints in these records, but the vast majority of prints were recorded in the Print Department records, which are separate from the eleven Painting stock books that have been digitized and transcribed and are represented here.